"This week, I was honored to be one of the first guests on First Look with Scott Cox. It was good to catch up with Scott and Richard on this new media endeavor. We discussed issues being debated on Capitol Hill, like immigration, education, tax reform, and the budget. We have a broken system that needs to be fixed and the biggest roadblock to those issues is the fiscal mess facing our nation. That is why I believe in putting our nation on a more fiscally-sound path so we can properly address the challenges facing our nation. One of those challenges lies within the VA, and the VA leadership’s inability to ensure that our veterans receive benefits and care in a timely manner. "I am proud that our communities make up one of the most patriotic regions in the nation and we must honor and care for those who defend our freedoms. That is why the backlogs and wait times that our veterans endure at the VA is unacceptable. I told some of their stories at a congressional hearing with a top Veterans Affairs Department official this week, and frankly, I am not satisfied with their responses and commitments to fix the ongoing problems in the VA. When many are seeing their budgets reduced, the VA has seen theirs increased along with a significant increase in their workforce. Yet, their productivity is down significantly and has failed to keep pace with the amount of new claims. On a local level, after being audited at the request of Congress, the VA chose to shut down the Los Angeles Regional Office for four weeks to retrain its employees in order to increase quality, yet evidence shows delays continue as normal according to the VA’s own Monday Morning Workload Reports. The problem we’re seeing is a flaw in the VA’s leadership to demand results, and unfortunately, I am coming to the conclusion that without continued Congressional oversight, this Administration is either unable or unwilling to implement the necessary changes to better serve our veterans. Those changes aren’t hard to identify; the independent GAO audit that I called for makes recommendations that can and should be implemented immediately. If the VA doesn’t take proper action, our veterans can be assured that the House will. "In the next few weeks, I will welcome more of our local World War II veterans to our nation’s capital on another Honor Flight from Kern County. They remind me not only of the sacrifice our veterans have made for our freedom, but also the sacrifices made by their generation to transform America into a nation of economic prosperity. "And this week in Washington, I worked to continue our fight to rein in reckless Washington spending and balance the budget. I voted for the Path to Prosperity, a responsible budget that passed the House that eliminates annual deficits within ten years, simplifies the tax code, repeals Obamacare, and strengthens and protects programs like Medicare. By balancing the budget, we can build a growing economy that creates jobs, reduces uncertainty, and takes us off the path to insolvency. Unfortunately, the President and Senate Democrats have indicated that balancing the budget is not a high priority, and the proposed Senate Democratic budget demonstrates just that; it has no plan to ever balance the budget. I believe, as billions of dollars in interest compounds on our $16.7 trillion national debt, that this is not only the wrong policy because it will weigh down any economic recovery, but it is also morally wrong because it continues to place the burden of debt onto our children and grandchildren and reduces their future opportunities for success. In fact, a recent Gallup poll indicated that older and young Americans don’t believe the next generation will have the same opportunities or ability to live better than their parents. That’s why I will continue fighting for responsible policies that help American families today and to ensure that future generations have greater opportunities to lead the lives they aspire to in a prosperous society. With the Arts Council of Kern in turmoil, a new arts non-profit opens its doors, and what are the 22 secrets to a long and happy life? * ... HAPPINESS: I read with interest a piece called "22 Things Happy People Do Differently" on a website called "Successify." Among those things to consider: don't hold grudges; accept what cannot be changed; speak well of others; take time to listen; never seek approval from others; live minimally; eat well; exercise; tell the truth and never make excuses. Sounds like a good place to start. 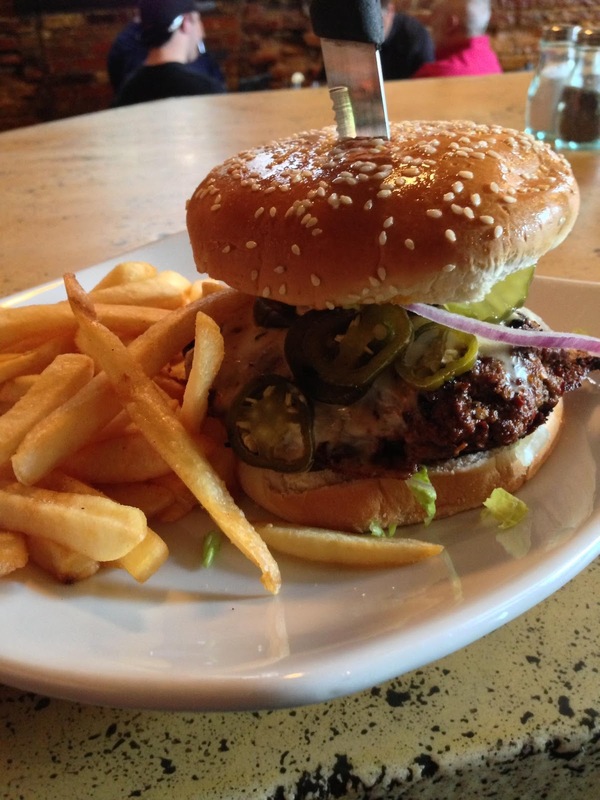 * ... BURGERS: There are a lot of good hamburgers in town (Juicy Burger, In-N-Out, Tahoe Joe's, The Padre to name a few) but my top pick is the Hudson burger over at Muertos Kitchen and Lounge in the Wall Street Alley. If you haven't tried it, make sure you do so. And what is your favorite burger in town? 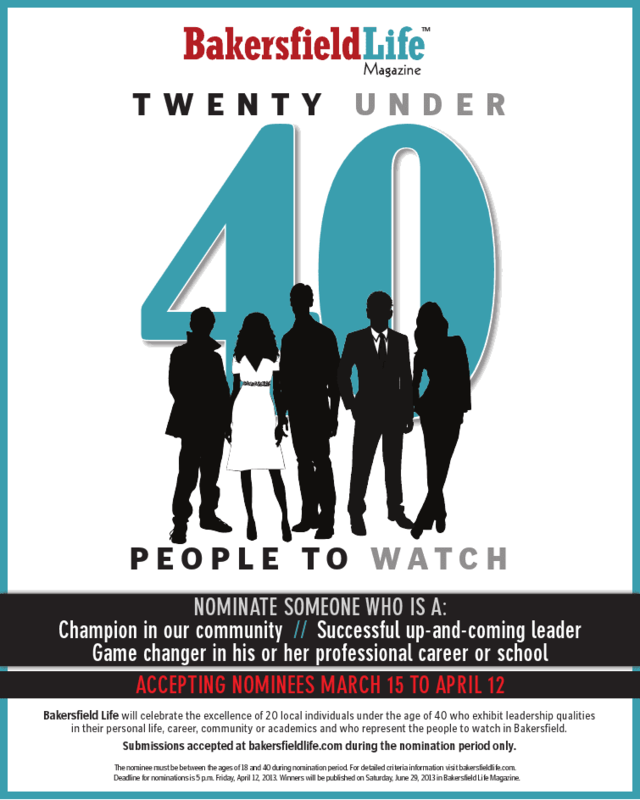 * ... YOUNG TURKS: BakersfieldLife, the premier glossy city magazine around town, is accepting nominations to recognize some of the up and coming young people in our community. This "20 under 40" competition will recognize folks who give back to our community while showing outstanding character. The nominations can be made at www.bakersfieldlife.com until April 12. * ... NO BUTTS: Hats off to the nearly 50 students from Freedom Middle School and Almondale Elementary (Rosedale Union School District) who participated in the No Butts Left Behind (NBLB) program, designed to raise community awareness about cigarette butts littering and its impact in the environment. This week they helped clean up Almondale Park in the northwest. Rosedale Union students have already cleaned up two other parks in the past several weeks. In an hour's time at each park, Polo Community Park yielded 1,796 butts and North Rosedale Park's total was 1,255. * ... BAKERSFIELDISM: You may be a Bakersfield old-timer if you "stopped in the evening on the way home from school for milk and bread at Niles Street Liquor and picked up .22 ammo at the same time." 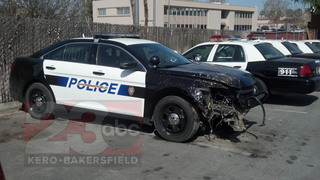 Local ABC affiliate KERO is reporting a Bakersfield police cruiser was nearly destroyed when a police officer took it for a joy ride on the unopened Westside Parkway. The station is quoting an unnamed source saying the officer was racing down the parkway when he/she hit a bump, forcing the car to crash. * ... PEREZ: As predicted 5th District Supervisor Leticia Perez, who has been in office less than three months, is running for the open 16th state Senate seat abandoned by her former mentor Michael Rubio. Aside from her willingness to abandon a job she was just elected to, it should be interesting to watch her square off against Fran Florez, recognizing that there is no love lost between these two camps. And, add to all this the odd, made-for-TV movie storyline of Leticia's husband Fernando Jara, a self described former street thug who converted to Islam, learned Arabic and claimed to have worked with the CIA before coming home to devote his life to helping men with addictions. That's enough content for a 13-part series on HBO, but that's his story and he's sticking to it. Who needs fiction when you have stories like this? Stay tuned. * ... SPOTTED: Two fathers get in a good old fashioned brawl at the BASA softball fields Monday during the Centennial High School junior varsity tournament, embarrassing not only themselves but also their daughters on the field. * ... BAD FORM: Stephen Montgomery was driving to Santa Maria on State Route 166 last week when he found himself being tailgated by a black Chrysler. "After riding my bumper for a few miles the driver passed me. I was surprised to see his vanity plate that read CHIP 2 with a small CHP logo on the left side. This guy, apparently one of California's finest driving his private car, later had pulled over with his left wheels almost touching the side line on the highway. He had his door wide open extending well into the driving lane but closed it when I got close but not before I had pulled over the center line to avoid it. Soon he was back on my tail before passing me again and disappearing. Oh yeah, I was not dragging my feet. In a 55 zone I was moving at 64 mph. What an example!" * ... FIRST LOOK: Make sure you tune into bakersfield.com on your computer or iPad tomorrow for First Look with Scott Cox. Cox will be talking to Sheriff Donny Youngblood at 8 a.m. and Californian columnist Lois Henry will be on at 9 a.m., all from the Dignity Health studios inside The Bakersfield Californian. Watch it live or hear it on NewsTalk 1180 KERN from 7 a.m. to 10 a.m. 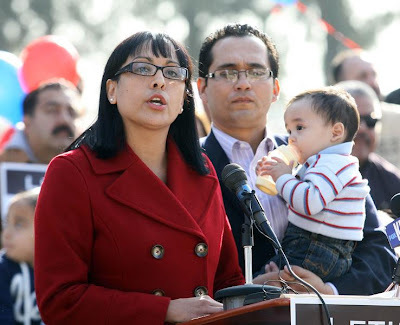 In what can only be described as one of the oddest stories of the day, the husband of 5th District Kern County Supervisor Leticia Perez is revealed to have converted to Islam and to have worked with the CIA in Yemen and other countries after the September 11 attacks. His name is Fernando Jara, and according to a front page story in the Los Angeles Times, he is a former gang banger who - in search of himself - converted is Islam. After the September 11 attacks, he claims he offered up his services to the CIA and was sent overseas. He apparently speaks fluent Arabic and now runs a recovery center for addicts. * ... LITTER: Interesting tidbits from the local campaign to clean up our community. The group, called "Litter: It's Beneath Us," estimates that the U.S. spends more than $11.5 billion each year for litter clean ups. In addition, 36 percent of business development officials say that litter impacts a decision on whether to locate to a community. And, fully 85 percent of littler is the result of individual attitudes. Somehow that does not surprise me. * ... VOLUNTEERS: Kudos to the group of retired citizens who are working with CalTrans to pick up trash along the Freeway 99 off and on ramps. These folks are volunteering their time to pick up trash discarded by others, and we all owe them a pat on the back. * ... MORE LITTER: And finally this, from the Bryan Kelly of Trader Joe's: "This is so totally awful... going west on 178 (what used to be a pleasant drive when litter was not so abundant) behind a pick-up loaded with household items, table, chairs, bookshelf etc... strapped in were two white plastic garbage bags. One had to assume these had been used for packing, as nobody would move garbage but a hole was ripped open in one and the contents were blowing to the four winds. When an empty toilet paper roll hit my windshield, I decided to at least pass and give the driver a dirty look. As I reached the bed of the truck a rat sticks his head out and obviously doesn't like the wind so he dives back leaving his tail to blow for a few seconds. They were at least driving away from our house." * ... FIRST LOOK: A new, local three-hour radio and video newscast kicks off Monday morning, the first of its kind in the nation pairing the local newspaper with the leading news talk radio group. It's called First Look with Scott Cox and it will be produced from a new radio and TV studio built in the middle of The Bakersfield Californian newsroom. You can hear it on NewsTalk 1180 KERN or view in on your computer or iPad on bakersfield.com. The studio is named for Dignity Health, the leading medial provider in Kern County. The show will feature news, weather, entertainment and analysis from The Californian's staff of editors and reporters. 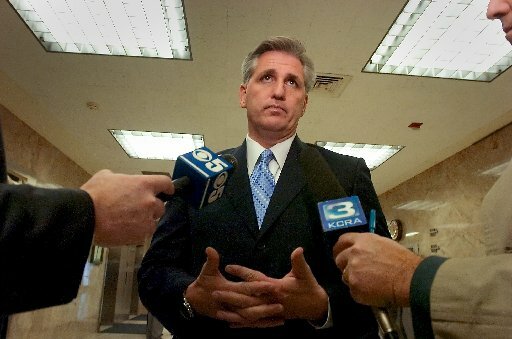 House Majority Whip Kevin McCarthy will be the first guest on First Look at 7:30 a.m.
* ... SPOTTED: On 34th Street across from Bakersfield Memorial Hospital an ambulance approaches with sirens blaring. Traffic is pulled over but a young couple, pushing a toddler in a stroller and mom carrying a newborn, are stranded on the center median. Undaunted, they decide to make a run for it, crossing 30th Street in front of the ambulance, laughing with relief as they catch their breath safely on the other side. * ... TEXTING: Here is one person's testimony about the dangers of texting while driving. A reader, who asked to remain anonymous, said her husband was following a mini van in the Northwest when it suddenly veered off the road and slammed into a tree. He stopped and went to the driver's side to find a woman in an apparent daze. "She told my husband that she had been texting. Seeing that she was clearly horrified and upset and not wanting to make her feel even worse, (although he rightly could), he told her that everything was going to be okay, that no one was hurt except a tree and her van, but that he truly hoped she learned a lesson from it, as that tree could have just as easily been his family going for a walk. She then began to cry even harder realizing this horrifying truth and said she knew she should not have been doing it. 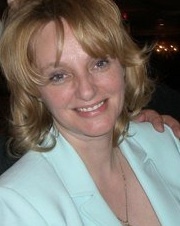 The police and her husband were called and my husband left. I wanted to share this with you so that we can once again remind readers to please not text and drive, facebook and drive, or do anything else on their phones while driving! Thankfully this situation was not horribly tragic, (except of course for the tree) but it certainly could have been."